As we examine the leader in the mirror, we should see improvement and growth as we work to enlarge our sphere of influence by learning and practicing new skills based on principles that represent the people and causes we value most. To grow as a leader we must have integrity, empathy, and critical thinking skills to create understanding. The Greeks called this set of skills ethos, pathos, and logos. Ethos pertains to creating trust and confidence in others. Do we walk our talk? Do we keep our promises? Do we live a life guided by principles that others can clearly see? Pathos is concerned with understanding another person’s feelings, needs, and requests. Logos involves the logical thinking skills to problem solve as well as implementing solutions. The ancient Greeks saw the skills of ethos, pathos and logos as the pathway to developing a vibrant community with effective leadership. When we have and use ethos people trust us enough to tell us their true feelings, needs and requests in order to make their lives better. With pathos we become skilled listeners as we hear each person’s point of view in order that we may try to figure out how to make life better for that person or organization—be it an organization of two or two thousand people. Using logos helps us possess the thinking skills to see the logical consequences and impact of making the changes requested. If we try to short cut this process, we may see our efforts to effect change be met with resistance or rebellion. 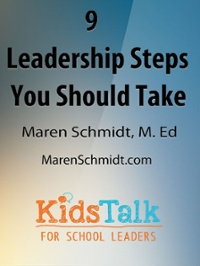 The leadership step that most of want to jump over is usually the pathos, or listening step. Using pathos can seem to be time-consuming but when we listen effectively, the logos or problem-solving step seems to flow easily. When we do meet with resistance we have a signal that we need to listen again, and use those pathos skills. As adults, we may desire to “fix” our children’s problems without listening to their input about the situation. Not asking for input diminishes our ethical impact with our children. Children quickly sniff out insincerity. Not picking up on clues—verbal and non-verbal—tends to lower our credibility. Listening and asking the right questions are vital to our leadership. George and Martha had grounded their eight-year-old son, Dennis, after hearing from neighbors that Dennis had been riding his bike on a busy street that was strictly off limits. George sent Dennis to his room, and he told Dennis that he would miss afterschool playtime for a week and that he wouldn’t be able to ride his bike for a month. Day Two of the punishment saw Dennis climbing out his bedroom window. Grounding was extended another week. Day Three Dennis threw things in his room and yelled. Day Four, Granddad Don appeared and asked Dennis if they could visit. Dennis reluctantly agreed and his grandfather began making an ethical appeal. Dennis’ grandfather listened and only asked questions to clarify what Dennis was trying to communicate in terms of his feelings, needs and requests. He listened in order to hear Dennis’ point of view. Granddad Don listened empathetically until Dennis defined his own problem and solution. Dennis asked his grandfather to confirm that Dennis was at a friend’s house the day of the bike incident, and asked his granddad to communicate that to his parents. Later, Dennis with his granddad and parents explored ways to become more trustworthy. Ethos, pathos and logos. Leadership skills that help others help themselves.